Since Corix Partners started to look at cyber security in the Cloud back in 2012, its adoption has continued to grow. 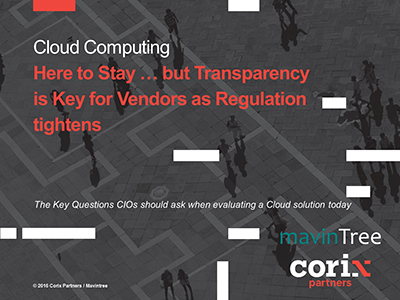 This is not only attributable to the continued pressure on costs but more importantly due to the realisation that the Cloud can offer greater flexibility and potential reduction in the “time to market”. Consequently, many organisations have moved some of their services to the Cloud – most noticeably office automation to Microsoft Office 365 or Google Apps for Work. The Harvey Nash / KPMG CIO Survey 2016 “The Creative CIO”, highlighted that four in ten IT leaders use cloud technology to improve responsiveness as well as resiliency.